Create stunning Instagram Stories ads in a couple of minutes. No marketing budget to speak of. At best, basic video, photography and editing skills. This doesn’t sound like a winning recipe for launching a successful ad campaign. Not by a long shot. But, if you fit the profile, you’re probably not at so great of a disadvantage as you might think. 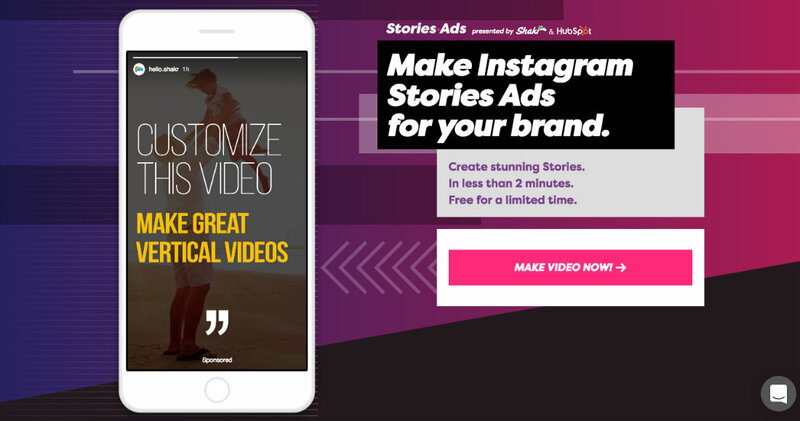 StoriesAds is a tool that lets you make Instagram Stories ads in just a couple of minutes. It’s currently free to use, and pretty much anyone capable of uploading a video has sufficient design chops for success. Created by online video maker Shakr in collaboration with the inbound marketing and sales platform HubSpot, StoriesAds supplies templates that make building a stories ad extremely easy. You select a template, then customize visual content – using either your own videos and images or the stock sources available on StoriesAds. Simple cropping is about as technical as the process gets. Add any desired text to text fields, repeat to fill a second screen, and you’re done. Wait a minute or two for your story ad to be ready and then find it in your email, where you can download it for use from your phone as a native Instagram Stories ad or for posting via desktop on Facebook Ads manager. Doesn’t matter what industry you’re in, StoriesAds is simple and versatile enough to be of service to everyone. Not only is video content a potent vehicle for relaying a message, but reports show that people find Instagram ads less obtrusive than other ads. They don’t perceive them as cluttering their social media feeds. So, to recap, StoriesAds empowers you to promote your products and brand using the incredibly popular and effective story format, through one of the most dynamic venues online (Instagram), without denting your bank or taxing your creative skills. A no-brainer, right? To get started making Instagram Stories Ads with StoriesAds, click here.